Current Affairs Quizzes given in this write-up are very important for the upcoming UPSC IAS Prelims Exam 2017. IAS aspirants must go through such questions before appearing for IAS Prelims Exam 2017. 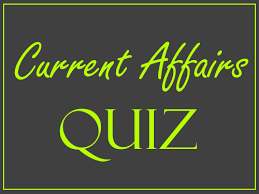 Go through the current affairs quizzes and check your progress. The IAS aspirant must do study and practice of current affairs IAS questions during IAS Exam preparation. The practice of IAS questions will help IAS aspirants to gain momentum during IAS preparation. Here, in this article, we have provided current affairs IAS questions quite essential for IAS Prelims Exam 2017 preparation. I. Index of Economic Freedom was released by a top US based Think Tank, The Heritage Foundation. II. In its 23rd edition, the Index analyzed economic policy developments in 186 countries. III. India slipped to 143rd spot in the 2017 Index of Economic Freedom. India’s overall score of 52.6 points is 3.6 points less than that of 2016, when India ranked 123rd. India ranked a dismal 143rd in 2017 Index of Economic Freedom, which has been released recently. The index was released by a top US based Think Tank, The Heritage Foundation. The Think Tank in its Index of Economic Freedom report stated that despite India sustaining an average annual growth of about 7% over the last five years, growth is not deeply rooted in policies that preserve economic freedom. In its 23rd edition, the Index analyzed economic policy developments in 186 countries. Countries are graded and ranked on 12 measures of economic freedom that evaluate the rule of law, government size, regulatory efficiency, and the openness of markets. Corruption, poor management of public finance and underdeveloped infrastructure continue to undermine overall development of the country. However, the economy has sustained an average annual growth rate of about 7% over the past five years. I. The vaccine manufacturers can only apply for WHO vaccine prequalification if the NRA meets the standards of the WHO NRA published indicators. II. In the recent assessment the Indian NRA has been declared ‘functional’ with a maturity level of 4.
WHO has completed the assessment of the status of the Indian vaccine regulatory system against WHO NRA Global Benchmarking Tool (GBT) for benchmarking and measured the maturity of the system. The assessment has been done in respect of nine different functionalities and Indian NRA has been declared ‘functional’ with a maturity level of 4 i.e. the highest level as per currently evolved definitions in respect of 5 functions, and maturity level 3 in respect of 4 functions. The vaccine manufacturers can only apply for WHO vaccine prequalification if the NRA meets the standards of the WHO NRA published indicators i.e. WHO Global benchmarking Tool on functional regulatory system for vaccines. The nine functions included in the tool are National Regulatory System; Registration and Marketing Authorization; Vigilance; Laboratory Access and Testing; Regulatory Inspection; Clinical Trial Oversight; NRA Lot Release; Licensing Premises; and Market Surveillance and Control. 3. Which of the following ship is the first Indian all women circumnavigation of the globe expedition of the Indian Navy? The Indian Navy’s second ocean going sailboat Tarini has been inducted recently. The sail boat Tarini is being inducted into the Navy and is slated to be the platform for First Indian All Women Circumnavigation of the Globe expedition of the Indian Navy. Extensive trials of the newly built INSV Tarini were successfully completed on 30 January 17. Indian Navy will is operating four sailing vessels capable of open ocean deployments, that is, Tarangini, Sudarshini, Mhadei and Tarini, all four of which have been built in shipyards at Goa. Indian Navy is attempting to revitalise open ocean sailing and will also be inducting four 40 feet, state of the art open ocean racing sail boats. I. ICGS AYUSH is capable of undertaking multifarious tasks such as surveillance, interdiction, search and rescue and medical evacuation. II. In ICGS AYUSH, the fast patrol vessel (FPV) is equipped with state-of-the-art navigational and communication equipment including Integrated Bridge System (IBS) and Machinery Control System (MCS). Indian Coast Guard Ship ICGS AYUSH was commissioned on 18 February 2017 in Kochi, Kerala. The ship was commissioned by Vice Admiral AR Karwe, Flag Officer Commanding-in-Chief, Southern Naval Command. • The fast patrol vessel (FPV) of ICGS AYUSH is fitted with state-of- the-art navigational and communication equipment including Integrated Bridge System (IBS) and Machinery Control System (MCS). • The ICGS AYUSH is capable of undertaking multifarious tasks such as surveillance, interdiction, search and rescue and medical evacuation. • Post commissioning, the ship will be based at Krishnapattnam in Andhra Pradesh. • The vessel will be under the administrative and operational control of Commander, Coast Guard Region. I. The cryogenic upper stage, designated as G25, was tested at ISRO Propulsion Complex (IPRC) at Sriharikota in Andhra Pradesh. II. With this successful test of the Cryogenic Upper Stage, India has joined the elite group of select countries that have the technology to in manufacture such engines. After historic launch of 104 satellites at one go, the Indian Space Research Organisation (ISRO) on 17 February 2017 successfully has tested its indigenously developed Cryogenic Upper Stage (CUS) for GSLV MkIII rocket. The cryogenic upper stage, designated as C25, has been tested recently at ISRO Propulsion Complex (IPRC) at Mahendragiri in Tamil Nadu. It was tested for flight duration of 640 seconds. In order to validate all the systems, the C25 Stage was also successfully tested earlier for 50 seconds on 25 January 2017. With this successful test of the Cryogenic Upper Stage, India has joined the elite group of select countries that have the technology in manufacturing such engines. The other countries to have the same technology are Russia, the US, China, Japan and France.